Dr Catherine McGowan is a veterinarian with an interest in equine performance. She has her PhD in Equine Exercise Physiology and Royal College of Veterinary Surgeons (UK) Diploma in Equine Internal Medicine. She developed and coordinated the Royal Veterinary College’s Masters and Post Graduate Diplomas in Veterinary Physiotherapy and the University of Queensland’s Masters of Animal Studies (Animal Physiotherapy). Lesley Goff is a Physiotherapist who completed Masters programs in both Manipulative Physiotherapy and Exercise and Sports Science and practised in animal physiotherapy before completing her Masters of Animal Studies (Animal Physiotherapy). She is currently still at the University of Queensland both teaching for the Animal Physiotherapy Masters program and completing her PhD on sacroiliac joint dysfunction in horses. 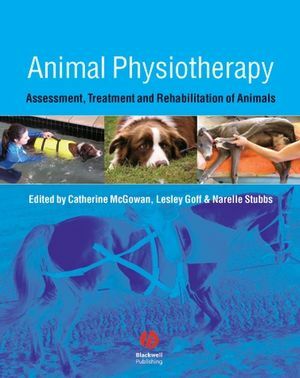 Narelle Stubbs is a Physiotherapist who practised as an animal physiotherapist and ACPAT Category A Member in the UK and Australia, including being the official physiotherapist for the Australian Equestrian team (horses and riders) since 1998, before completing her Masters of Animal Studies (Animal Physiotherapy). She is currently still at the University of Queensland both teaching for the Animal Physiotherapy Masters program and completing her PhD on back pain in horses.